The Barcel Suzuki String Academy began its work to educate children through the Suzuki philosophy in 1994 under the tutelage of Suzuki registered teachers Celestine Fitzgerald and Barbara Schaefer. Mrs. Fitzgerald and Mrs. Schaefer bring to the program a total of over 30 years of experience teaching children of all ages. Faculty members Colleen Fitzgerald and Gina Wood joined the Academy in 1996 and 1998 respectively, and Emily Stodola came aboard in 2010. The Academy provides a challenging and encouraging environment for children to study music. Barcel students experience music in private and group lessons, solo and ensemble recitals, and community service concerts. The mission of the Barcel Suzuki String Academy is to enrich the lives of children through music. By implementing Dr. Suzuki's philosophy and methodology, the faculty of BSSA creates an environment of learning and excellence, dedicated to joyful learning and community outreach. Through carefully guided private and group lessons, we reach the whole child, teaching violin skills as well as the life skills of cooperation, discipline and leadership. 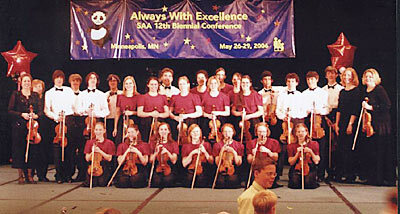 Brioso was one of three string ensemble groups, selected via videotape audition, to perform in the International Ensembles Concert at the Suzuki Association of the Americas (SAA) Conference 12 held May 26-29, 2006 in Minneapolis, MN. Performing at the International Ensembles Concert at the SSA Conference is one of the highest honors an ensemble group can receive. The four-day Conference served over 1,300 teachers, parents and students from North and South America. Highlights of Conference 12 included the Suzuki Heritage Celebration, the International Ensembles Concert, masterclasses with top-level clinicians, keynote addresses, Parents as Partners Day sessions, and the Suzuki Youth Orchestras of the Americas. Brioso shared the International Ensembles stage on Sunday, May 28 with the Nevada School of the Arts Violin Ensemble (Las Vegas) and the Rocky Mountain Strings (Salt Lake City). Founded in 1996 as part of the Barcel Suzuki String Academy, Brioso has been sharing the gift of music with others through regional performance tours, participation in the BSSA Festival Concert, performances for private functions and community outreach for over a decade. Brioso gives a big THANK YOU to all those whose donations & sponsorships made this performance possible!! Interested in becoming a BSSA student? Call to arrange an observation! "Knowledge is not skill. Knowledge plus ten thousand times is skill."